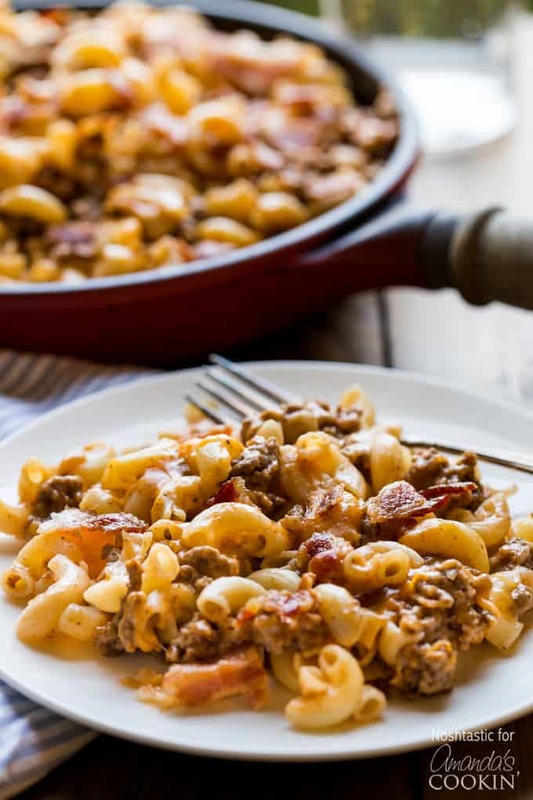 It doesn’t get much tastier than this Skillet Bacon Cheeseburger Pasta! This easy weeknight dinner is a great spin on an American classic and cooks in less than 20 minutes. 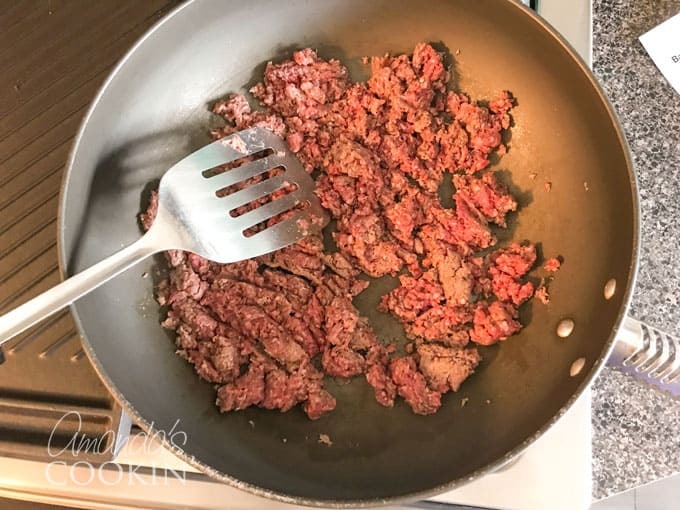 This ground beef meal idea is a real crowd pleaser, will keep in the refrigerator for a few days and can easily be reheated later on. Well, I don’t know about you, but for me, life just seems to get busier and more hectic every day. 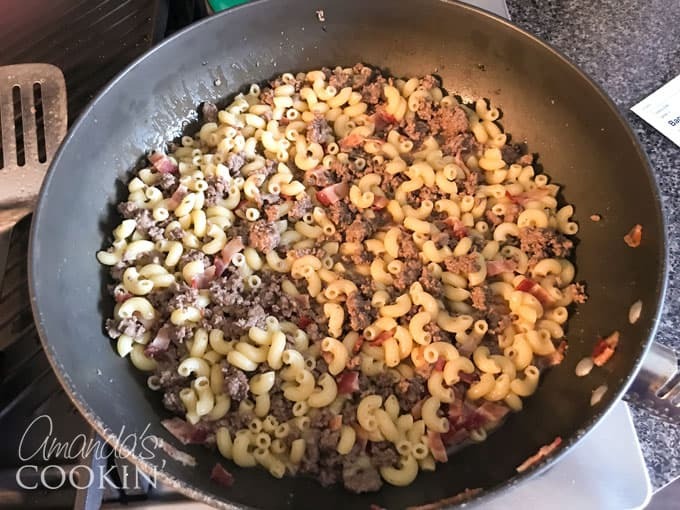 Often it means that preparing tasty, healthy meals that everyone in the house will love can sometimes be a bit of a challenge, so you’ll thank me for this really easy Bacon Cheeseburger Pasta recipe! It cooks up in a skillet and is ready to serve in almost no time at all. I was looking through an old Taste of Home book recently when I came across a very similar recipe and knew instantly that it would be something that I could tweak to cook on a weeknight without too much stress, and most importantly I knew my family would enjoy it. I have two boys at home and as predicted they really loved this recipe and even asked me to make it again. My youngest son is eleven, he had two bowls for dinner and asked for a third, it was that good! He even insisted on having a bowl when he came home from school the next day instead of his usual snack. Did I mention how simple it is to make? 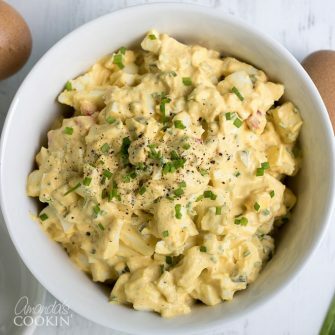 You can throw this together very quickly and have it cooked and ready to serve in less than thirty minutes, and you probably have most of the ingredients in your pantry and fridge already. This was just as popular as the John Wayne Casserole I’ve made several times. 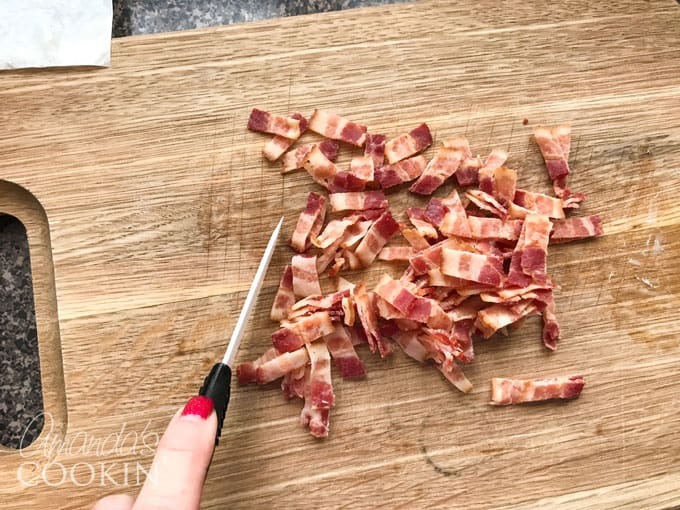 Cook the bacon first, I prefer to cook it on a sheet pan in the oven until it’s crispy but you can cook it whatever way you prefer. Drain it on paper towels and cut it or break it into small pieces and set aside. 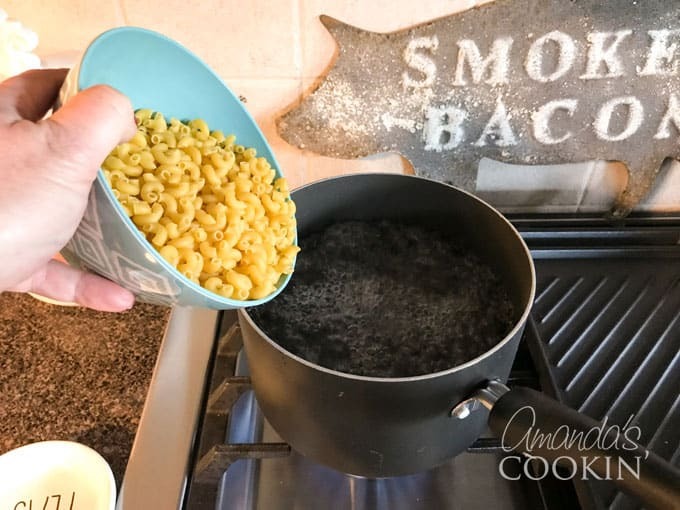 Cook your macaroni according to directions on the pack, then drain. 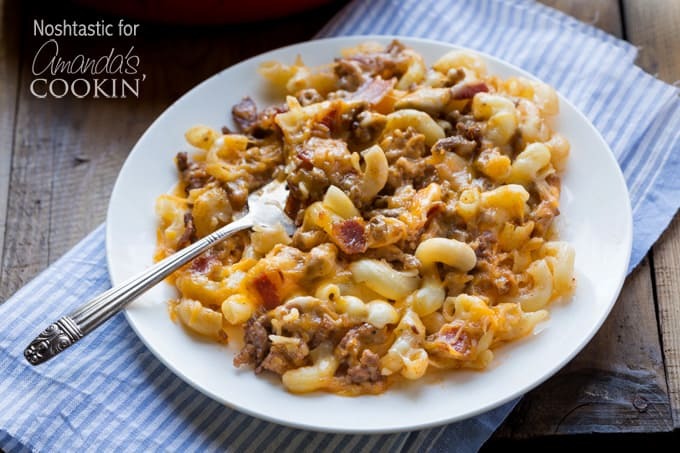 While the macaroni is cooking brown the beef in a large skillet until fully cooked. If after cooking the beef has a lot of fat/liquid/juice left you can pour some of that off, I prefer to use lean beef and keep some of the juice as I think it adds to the flavor. Measure the beef broth, Worcestershire sauce and ketchup into a small bowl or measuring jug and mix well to combine. Place cornstarch in a separate small bowl and add a tablespoon or two of the broth mixture. Stir until well combined then add that mixture to the rest of the broth mixture. Doing it this way will keep the cornstarch from clumping together. 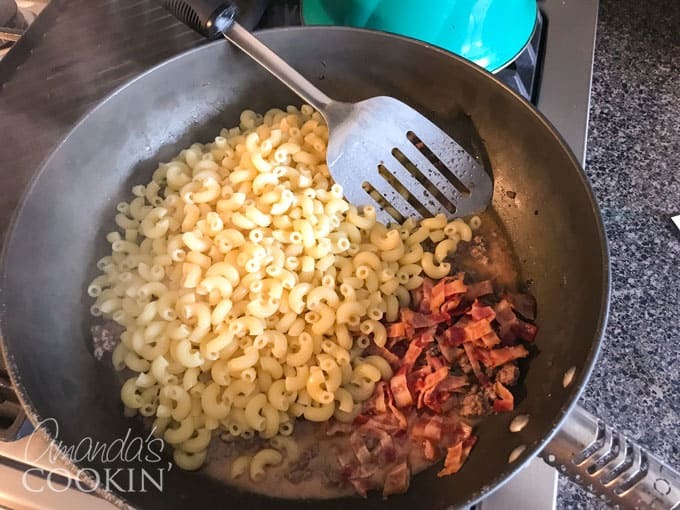 Add cooked pasta to the skillet along with the beef broth mixture, stir well to combine beef, pasta, bacon, and sauce. Cook on a medium heat until the sauce bubbles and thickens. If it’s too thick for you, thin it out with a little more beef broth. 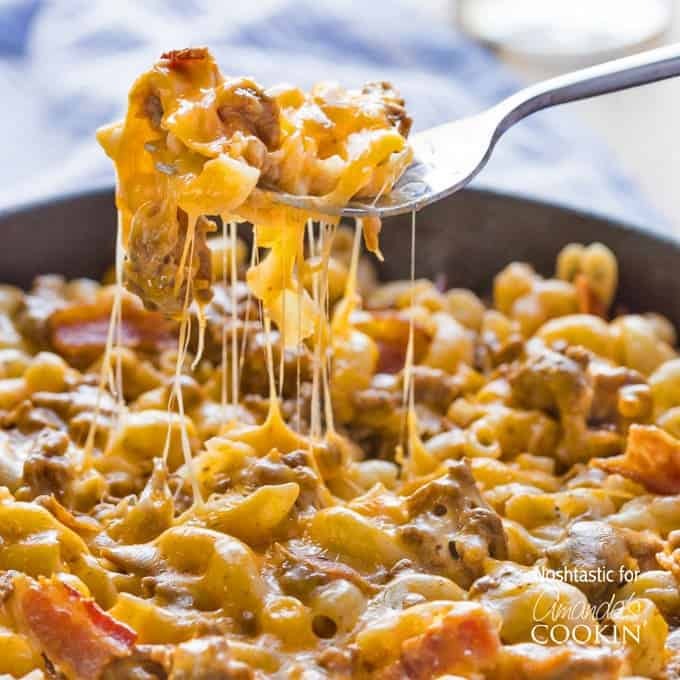 Sprinkle shredded cheeses over the top of the skillet cheeseburger mixture. Cover and cook on very low heat until cheese has melted, about 2-3 minutes. If you’d like to print this recipe, scroll down to the printable recipe card. 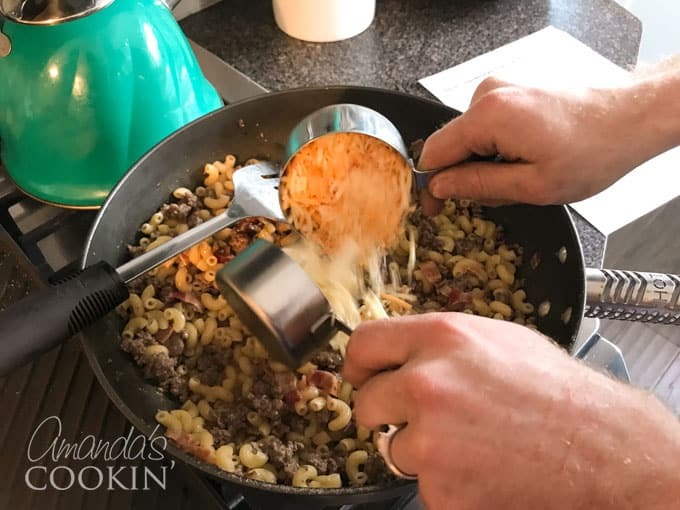 If you have gluten-free family or friends this would be a very easy dish to make for them, just substitute gluten-free pasta for regular, make sure the beef broth and Worcestershire sauce is gluten-free, and you are good to go! If they are also dairy free like I am then you can use a shredded vegan cheese substitute instead, it works just as well and I know they will thank you for it. 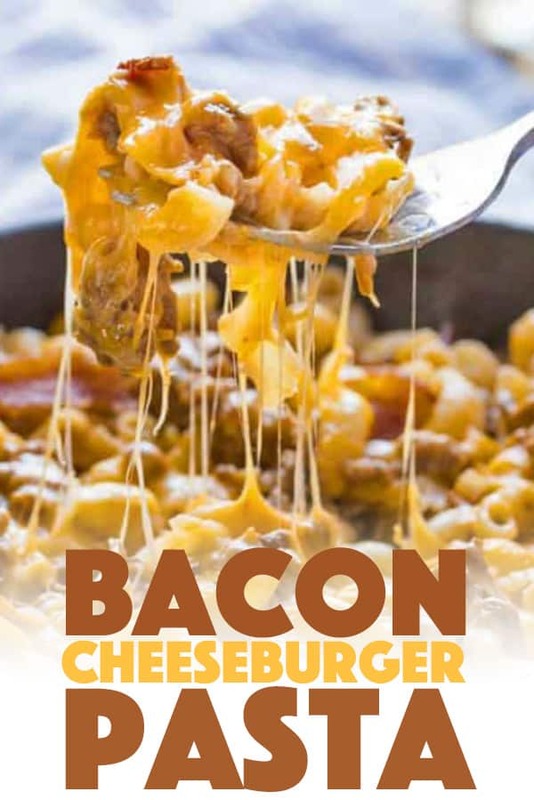 It doesn't get much tastier than Bacon Cheeseburger Pasta! This easy weeknight dinner is a great spin on an American Classic and cooks in less than 30 minutes. Adapted from Taste of Home magazine. Cook the bacon first, I prefer to cook it on a sheet pan in the oven until it's crispy but you can cook it whatever way you prefer. Drain it on paper towels and cut it or break it into small pieces and set aside. 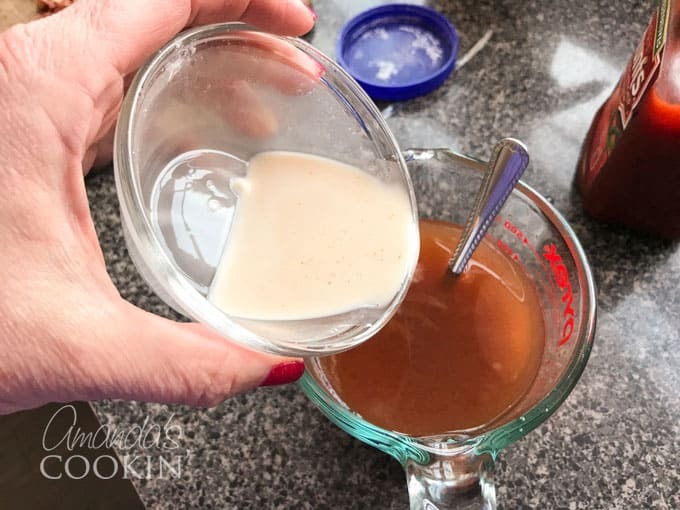 Measure the beef broth,Worcestershire sauce, ketchup, and cornstarch into a small bowl or measuring jug and mix well to combine the cornstarch. Cook on a medium heat until the sauce bubbles and thickens. If it's too thick for you, thin it out with a little more beef broth. 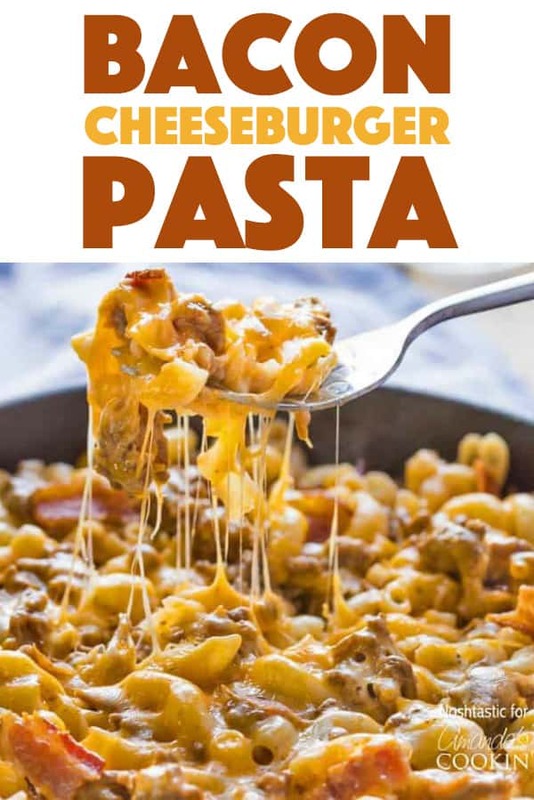 Sprinkle shredded cheeses over the top of the skillet cheeseburger mixture. Cover and cook on very low heat until cheese has melted, about 2-3 minutes. This post was originally published on this blog on April 12, 2016. I was looking forward to this recipe, but was disappointed. Next time I will sauté some diced Inuits and diced green or red pepper in a tablespoon of the bacon grease. It definitely will add some more flavor. I’m also going to try to add a can of baked beans to add liquid and flavor. This turned out really good. I added onion, mushrooms, bell pepper, and 1/4 grape tomatoes and I didn’t have bacon so I made it without.. (bet its supurb with it) I also didn’t have miss. So I used havarti dill I had on hand and it worked fine. This is a great way to throw together whatever you have on hand to make a fast meal. Thanks this one saved the day. Wow that’s a lot of changes but sounds delicious! Made this tonight, but didn’t have cornstarch, so I added flour. It was delicious! Thanks for sharing the recipe. I made this a couple of weeks ago and all my kids loved it. I will be making it this evening and adding dry ranch to it. I am sure that every one is going to eat it. I make this all the time n my family loves it. I do it just a little differently. I add diced onion. After the bacon is done, I soften the onion in the bacon grease, then add the ground beef and brown it. Adds such incredible flavor that it doesn’t matter if you drain all the grease. The flavor is in there. Like you and sooo many others, I’m a casserole junkie and my husband was constantly complaining about there always being so much. The next time I made one, I made just barely enough for the four of us. He immediately started whining about no leftovers, “This, my love, is exactly why I make so much”. Cheeseburger helper is my husband’s favorite, so this will be so much better. Thanks, and im going to cook allot of delicious recipes I’ve found. ? I hope it turns out to be a hit! :) Good luck with all your tasty recipes! Is there a way I can cook then froze? I would be concerned about the pasta getting mushy, mot to mention that melted cheese doesn’t freeze well. so I wouldn’t freeze it.